Smaller Town & Rural Facilities - Get a complete, statewide facility list in Excel format! In addition to listing assisted living facilities in Alaska, we may also include relevant articles, news and educational videos about assisted living and senior care. Assisted Living Directory is straightforward, and all facilities may be contacted directly. We will also highlight important state resources and agencies for you to further your research. Currently there are over 300 facilities in the State of Alaska. We also offer ways for you to ask questions, and to get personal help if you need it. Our video tutorials on this page discuss how residents typically cover the costs of care in Alaska. It’s important to note the Medicaid does not cover the cost of assisted living in Alaska. We also highlight several other important state resources with essential facility data and guidance. Located in Anchorage, Wesleyan House is an assisted living facility that offers 6 bedrooms that feels more like a bed and breakfast rather than an assisted living home. Working with an experienced and qualified care provider can save time, hassle, and guesswork. about Assisted Living and other forms of long-term care throughout Alaska! The process of finding the most appropriate assisted living home for yourself or a loved-one can be a taxing and confusing process. 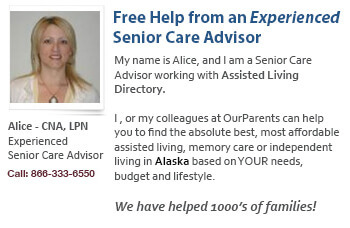 Our care providers are knowledgeable, and work directly with hundreds of senior care providers in the State of Alaska. We can help you to ‘weed out’ many of the facilities that are not a match for you – based on budget, care and amenities, price, location, or personal preference. We can quickly create a workable list for you. Our service is completely free to those families that we work with. We have a personal relationship with the communities we work with, and we can provide you the name of the person you need to speak with. We can answer questions about, or research the costs, expenses, and insurance. Did you know? : Haines has the highest growth rate of seniors per capita in the state. The Ark of Homer is a licensed six bed facility providing that “extra care” to early – moderate Alzheimer’s and Dementia clients. With a staffing ratio of 1 CNA/Care Provider to 3 residents in a loving, home atmosphere, you can rest assured that your parents, loved ones, are well taken care of. Laura Lee Owens, RN, Administrator is on staff for medication, nursing issues and with over 20 years of nursing experience she promotes staff education and training in Dementias. Physical: 109 East 5th Ave.
Lilley Lodge provides 24 hr. supervision, assistance with ADL’s, medication assistance, medical care coordination along with a variety of other services to bring you the highest level of independent functioning in a safe setting. Long term-short term residency, respite relief residency and hospice are available. Acceptance into Knik Manor Assisted Living is determined by apartment availability and resident needs. Each resident must have the ability to evacuate the building by walking down the stairs. you can learn where to find comprehensive State of Alaska-produced data and resources to help you find appropriate senior care in Alaska. We’ll also point you to a thorough .pdf list of licsnsed facilities statewide! compiled from trusted state-of-Alaska data. and an increase in expenses. Many assisted living facilities offer money management or bill payer programs to help you manage your finances. Trained volunteers help you to prepare your checks, balance your checkbook, and also help teach you to budget and organize paperwork. So you have now entered into the latter part of your life – the “Golden Years.” To some, this is a time to start slowing down, and to others, the time to stop having fun. We say ‘nonsense’ to that! We believe that these should be the best years of your life! Seniors can still take part in birthdays, have dessert, visit with loved ones, take up a new hobby, or even start dating again! Staying active and having fun is one of the best ways to help yourself to stay healthy! My 94-year-old dad is currently at a facility in Anchorage and has just started wandering. He’s had dementia for years, but this is a negative change. I am not sure if it’s Alzheimer’s. He is ambulatory but is incontinent. Everyone loves him and the facility wants to keep him, but we’re scared with the wandering. Do you have any openings? Do you keep a waiting list–we could make a deposit. Does he sound like the type of resident you work with? We really want a facility that is more secure, and with a better staffing ratio. Q: How do I go about opening an assisted living facility and getting it licensed in the State of Alaska? A: We recommend first that you look at Alaska’s Assisted Living Licensing Program site to get specifics on licensing procedures, and then look through our “How To Open” page that discusses the steps that you need to take. Alaska has fewer residents age 65 and older (7.7%) as compared to the national average of 13.0% (Source: U.S. Census Bureau QuickFacts for Alaska). However, the need for assisted living in Alaska is growing, and there are challenges. Due to the geographic complexity of the state, assisted living may not be as accessible to many of the seniors living in outlying areas. Creating a video for your assisted living facility can be a great way to help further promote your facility and widen the reach of your marketing efforts. However, there is a big difference between a professional looking and unique video and a poor-quality, amaterur-ish looking effort. One of the ways you can enhance your facility’s video is by using a slider to create a dynamic sense of movement. In this video tutorial, we talk about how to use a slider, and we’ve included a few examples where we have used one.